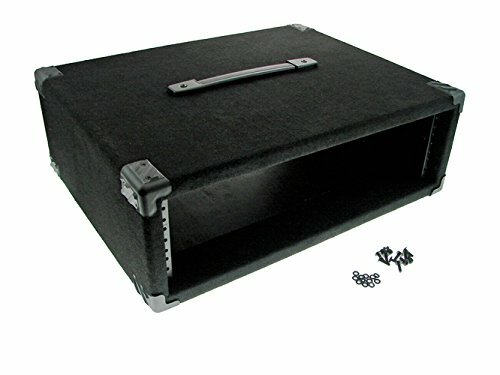 Procraft 3U equipment rack 16" deep, 3/4" birch plywood(light weight and very sturdy) with high quality, black automotive grade carpet. Procraft steel reinforced strap handle with T-nuts and machine screws, top mounted. Procraft protective corners. Penn Elcom pre-tapped rack rail(for 10-32 machine screws). Free set of 12 rack screws and washers included! Rack rail is installed 3/4" from the front edge of the unit. Rabbeted joints screwed and glued for years of service. Overall dimensions are(including corners) 21-1/4" Wide, 7-3/8" Tall and 16-1/4" Deep. Inside dimensions are 19-1/8" Wide, 5-3/8" Tall and 16" Deep. This unit does not include front or rear covers. All of our racks are manufactured at our modern facility in Jackson, Missouri. If you have any questions about this product by Procraft, contact us by completing and submitting the form below. If you are looking for a specif part number, please include it with your message.